We’ve all been there. Whether it is watching our child deal with a nasty stomach virus or fighting off a cold, sickness is one of the most heartbreaking moments in parenting. As cold and flu season approaches, parents everywhere are preparing to deal with the sneezing, coughing, and yucky secretions that come with illness, but is there a time when mucus drainage can be a cause for concern? What do you do if your baby is throwing up mucus? Spit up is the fragrance of parenthood. It’s so common, few parents can find clothes that haven’t been stained with it at some point. If spitting up is so common, how are you to know when your child is vomiting? And what if they are vomiting mucus? Begin by taking a look at the vomit. Spit up has a pretty unmistakable odor, and regular breastmilk or formula vomit does as well. They will also share the same pale yellow-white color of formula. Mucus, on the other hand, is usually thicker and can be either clear, pale green-yellow, or a brighter green-yellow. In newborn babies, vomiting mucus is normal, as it is how their bodies adjust to being outside of the womb, but there are other causes of mucus vomit as your child grows older. Why is My Baby Vomiting? Whenever your infant vomits, it likely sends you into a bit of a panic. One of the first questions that come to mind is: Why is my baby vomiting? As with adults, there are a vast number of things that can cause a baby to vomit, most of which range from a stomach virus to even the common cold. It is important to pay attention to the other signs of illness that your infant might be presenting in order to help you assess what is causing the vomit. When mucus is present in the vomit, it is most likely that your child is suffering from a respiratory-based illness such as the cold, RSV, the flu, or something similar. If your child is suffering from one of these illnesses, there are a few different things that might trigger vomiting. In each of the cases, it would be normal to see mucus in your child’s vomit. 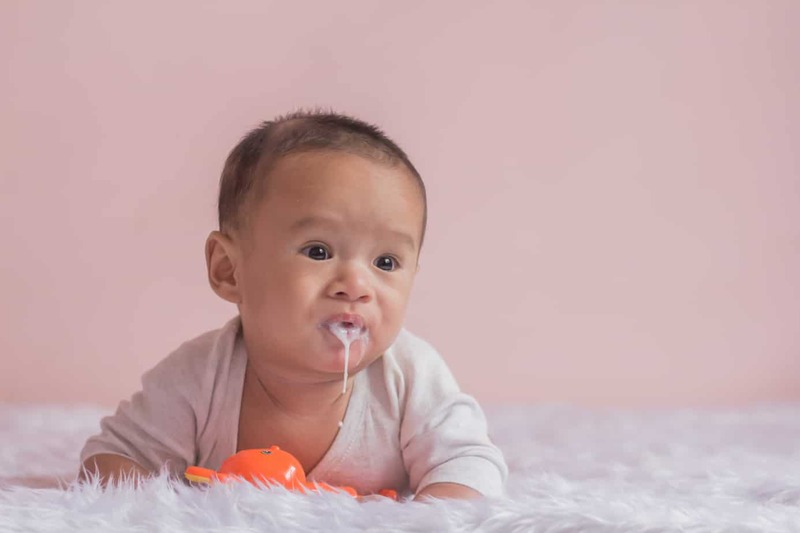 If your infant’s mucus is very thick during their illness, it can easily trigger a baby’s sensitive gag reflex, causing your baby to gag and even seem to choke on the mucus that is draining down the back of their throat. This gagging can cause vomiting. Coughing is the body’s natural response to the presence of irritants in the throat or lungs. The fast constriction of the muscles and forceful expulsion of air helps to clear your lungs and throat of mucus and phlegm (imagine beating a dusty rug with a broom). Because some irritants can cling stubbornly to the throat and lungs, some coughing fits can often be violent and painful, even causing vomiting. Mucus drains down the throat and is swallowed every day. It seems disgusting, but it is natural in the way that our bodies function. This becomes a problem when sickness increases the amount of mucus in the body. When too much mucus gets into the stomach, it can cause irritation to the lining, which can lead to vomiting. Hydration is a key factor for health, and it is especially so during times of illness. Hydration from baby formula or breast milk helps to thin the mucus in your baby’s body, making the congestion less uncomfortable and the natural flow easier. This, along with regular use of a saline nasal spray and a nasal aspirator or bulb syringe, can help to minimize the amount of mucus that your infant has draining down their throat. This will reduce gagging, coughing, and swallowed mucus that might irritate the stomach lining. A cool mist humidifier or even a hot shower will also aid in reducing congestion, and the moisture will provide dampness to the nasal passages allowing mucus to flow more easily. One final option would be to keep your infant elevated by using crib blocks or a wedge under their crib while they rest, allowing the mucus to drip down the nose instead of pooling in the back of the throat and causing coughing or gagging. If you are able, try to keep track of the number of times that your baby vomits within a time period. If your baby continues to vomit and seems unable to keep down fluids, then a call to your doctor is in order. Should there ever be blood present in your child’s vomit, take your child to the emergency room to be treated by a medical professional. Most stomach viruses pass within 24-48 hours, but a cold, the flu, and RSV have symptoms that last closer to 14 days, during which time your baby could be prone to vomiting if mucus has triggered gagging, coughing or an irritated stomach lining. Keeping track of the instances your child vomited helps to inform the doctor of your baby’s condition, should you need to see one. If you found this to be helpful please comment or share with friends and family.